At Wiki Education, we get pretty excited about initiatives which improve science content on Wikimedia projects. It’s why we ran the Year of Science in 2016, and why we continue that emphasis through Communicating Science. So Wiki Education’s Wikipedia Content Expert in the Sciences, Ian Ramjohn, and I jumped at the chance when invited to be part of the jury for the 2017 Wiki Science Competition in the United States! The Wiki Science Competition is an international photo contest to encourage the creation and free sharing of all sorts of science-related images. It began in Estonia, then expanded to all of Europe in 2015, and this year’s event includes the rest of the world. In November 2017, participants uploaded submissions to one of five categories. In the United States, we reviewed 818 images in the “general” category, 66 in “people in science,” 213 in “microscopy,” 47 “non-photographic,” and 36 “image sets” containing 184 images. Each country has its own jury, which selects 5 from each category to advance to the international competition. To see all of the finalists see the full results gallery here. For the U.S. competition, we also awarded 5 “Jury’s Choice” awards of $200 each, independent of categories, generously provided by Wikimedia District of Columbia. Below are the five Jury’s Choice winners, along with quotes from the photographers. Total Solar Eclipse 8-21-17.jpg, by Michael S. Adler, CC BY-SA 4.0, via Wikimedia Commons. 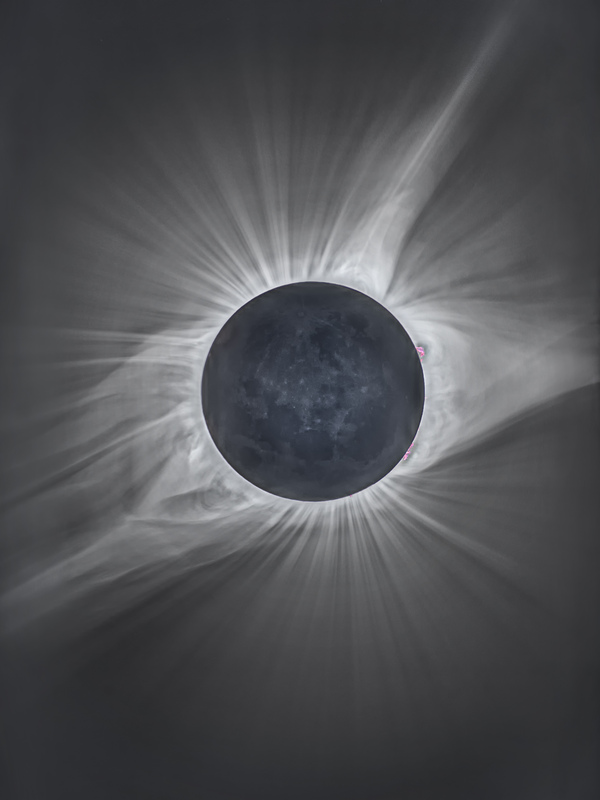 Michael S. Adler is honored for Total Solar Eclipse, an image of the 2017 solar eclipse from outside Crowheart, Wyoming. The image was taken using exposure bracketing in seven steps from 1/2 to 1/8000 seconds to show both the Sun’s corona and the surface features of the Moon itself. Adler also contributed a collection of images of galaxies and nebulae, of which an image of the Andromeda Galaxy also advanced to the international round. I have always been interested in astronomy and as a child had a 4″ telescope. Over the years I also developed an interest in photography mainly with a focus on travels all around the world such as recently to Nepal twice, Scotland 3 times, Iceland 3 times, New Zealand 3 times, Spitzbergen, and South America and Antarctica. About 20 years ago I acquired a high quality 6″ refractor and then after retirement from GE in 2000, I also equipped the telescope with an astronomical camera and other equipment for doing astro photography. Then in 2014 I built an observatory here in Jackson WY and added a 12.5″ and a 20″ telescope. My astronomy images can be seen at www.astrophotoworks.com. The eclipse was a natural extension of this since Jackson was in the area of totality and represented a once in a lifetime opportunity. I ended up using the 6″ telescope with a focal reducer giving it a 900mm fl at f6. The camera was a Canon 5D Mk4 and was shot using exposure bracketing in 7 steps from 1/8000 to 1/2 a second. The images were combined in Photomatix Pro and Photoshop CC 2017 was used as the final step. I was very lucky as the weather was perfect for the eclipse. Beautiful….But Deadly.tif, by John Bernbaum, CC BY 4.0, via Wikimedia Commons. 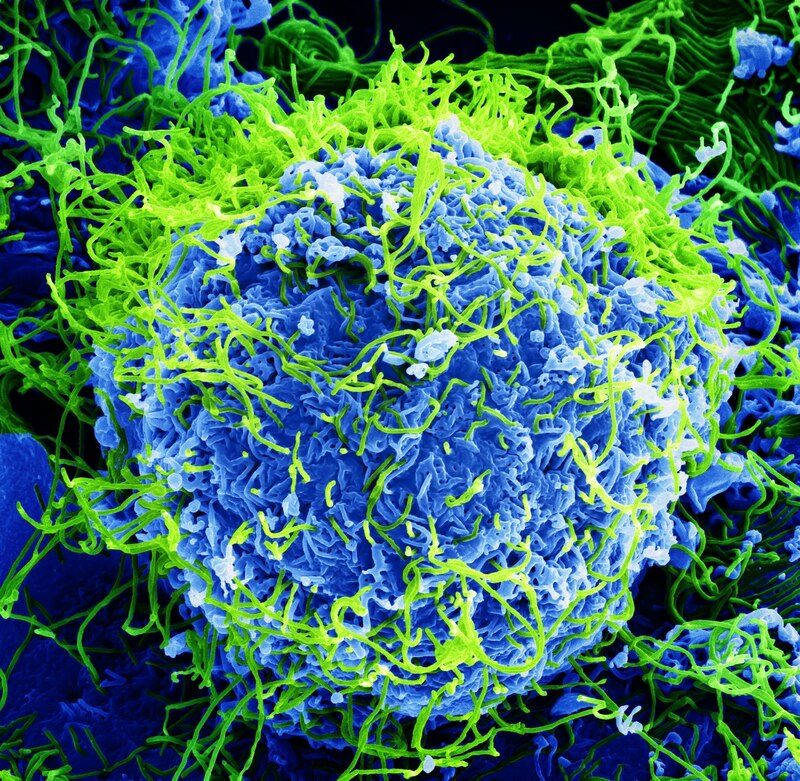 John Bernbaum is honored for Beautiful… But Deadly, a colorized scanning electron micrograph of Ebola virus particles (green), found both as extracellular particles and budding particles from a chronically-infected African green monkey kidney cell (blue), at 20,000x magnification. This image was taken in a biosafety level 4 facility, the highest level of biosafety precautions, which is used for easily transmissible agents that cause severe to fatal disease in humans for which there are no available vaccines or treatments. I’ve been an Electron Microscopist for almost 30 years, specializing in the photography of mammalian viruses. During my career, I’ve been extremely fortunate to have worked with many accomplished scientists on the forefront of virus research, as well as with a wide variety of virus types. Nine years ago, when the opportunity arose to work with Ebola Virus and other extremely dangerous pathogens in a high containment BSL-4 facility, I eagerly accepted. The photograph entitled “Deadly…But Beautiful” was originally taken in 2014, from the first sample of Ebola Virus I ever examined in the scanning electron microscope. The cells from that first sample were heavily infected with Ebola Virus, with more than one thousand copies of the virus replicating per each single cell. It was a sobering and intimidating view of this virus and its deadly potential, and a daunting reminder of the challenges scientists face every day as they work towards a vaccine. My brother Mark brought the Wikipedia Science Competition to my attention in 2017 and urged me to submit an image. After looking at all the amazing images submitted, the thought of having one of mine selected for recognition never really crossed my mind. To me, this was simply a wonderful platform and opportunity to share the combination of science, art, and beauty, with people all over the world. 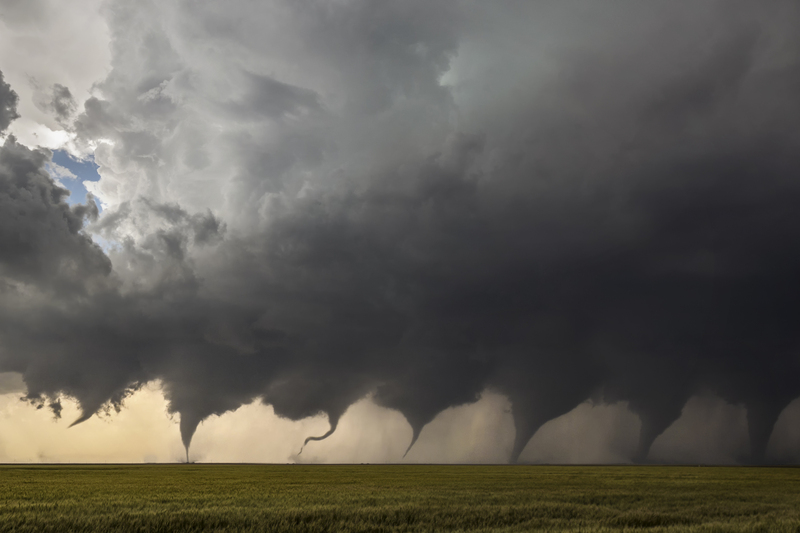 Evolution of a Tornado.jpg, by Jason Weingart, CC BY-SA 4.0, via Wikimedia Commons. Jason Weingart is honored for Evolution of a Tornado, a photomontage of eight images shot in sequence as a tornado formed north of Minneola, Kansas on May 24, 2016. This prolific supercell went on to produce at least 12 tornadoes, and at times had two and even three tornadoes on the ground at once. I am a professional photographer and storm chaser in the Austin, Texas area. Weather caught my interest at a very young age when a meteorologist visited our third-grade class and talked about tornadoes. Growing up, anytime there was a storm, I would stand outside and take it all in. Today, I specialize in leading photographic workshops and adventures. I made this image during a storm chasing workshop on May 24, 2016. We had forecast the area around Minneola, Kansas would see big storms that day, but I could never have imagined what was about to happen. We watched the storm form from a small cluster of cumulus clouds into a prolific cyclic supercell. It produced its first tornado just north of town, the one pictured in this progression image blend. When it was all over, the storm had produced at least a dozen tornadoes, thankfully over mostly rural areas. Nobody hurt, nobody killed. That’s about the best you can hope for in a situation like that. The image is blended together from 8 single images chosen from a timelapse; the initial updraft (near the top) and seven stages of the tornado as it grew into a strong EF3. I thought the Wiki Science Competition seemed like a good way for me to give something back to the scientific community that has tremendously shaped my life. Scientific imagery sparks people’s imagination and has the ability to changes lives. I am honored to be one of the finalists selected from the United States. The quality of the images in this competition are really top notch. Mantis Fly – Genus Plega.jpg, by Ron Sterling, CC BY 4.0, via Wikimedia Commons. 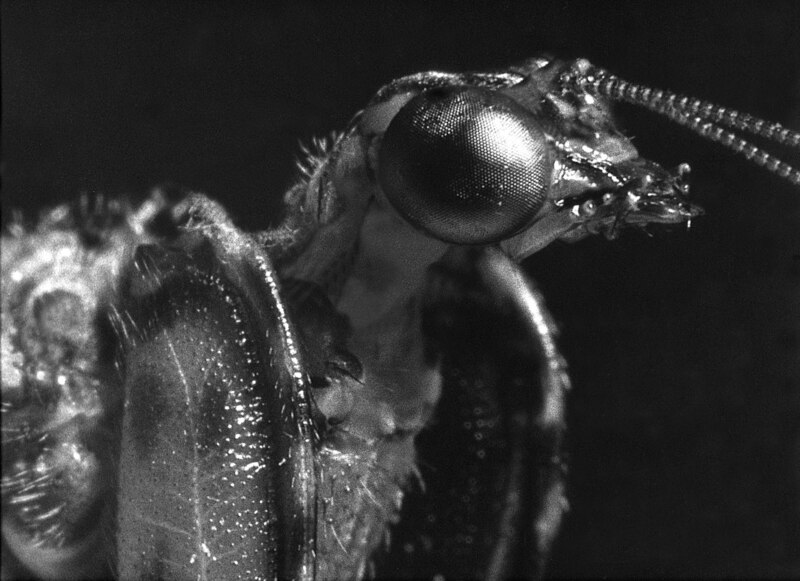 Ron Sterling is honored for Mantis Fly, a very close black-and-white film macrophotograph of a live mantisfly found in the Santa Rita Mountains of Arizona in August 1963. The original 12×15 black-and-white print was scanned in 2010 to produce a digital version of this photograph. Sterling also contributed a collection of wildlife photographs taken over the course of decades. I call this one of my many miracle insect photographs taken during the years 1960 through 1966. It had to be a strange sight for others to watch me, a gangly 17 year old, leaning against a campground bathroom wall at night, inching along as slow as possible to not scare off the mantispid and holding a 35 mm SLR, with a 50 mm lens attached to a 4” extension tube with an old-style, early electronic flash system called a Strobonar Futuramic mounted sideways directly above the lens, stalking this mantispid while it stalked food, in the Santa Rita mountains of Arizona. Talk about hunting small game! When the Strobonar went off at a distance of about six inches from an insect like this mantispid, it is a bit of a shock for them to say the least, yet, this one just trucked on over about a foot away and continued to hunt. Not sure I have seen that kind of non-startle in an insect ever. I became what I would call a die-hard “naturalist” during my sixth grade year (1957). My science teacher at that time was incredibly good at conveying the excitement of understanding how things seem to work in the animal world and my project for the year was to put together a high-quality, crafted set of six trays of pinned and mounted insect specimens. That and a friend of my dad’s who was a “certified” naturalist and published a magazine called the Naturalist (Associated Nature Clubs of America) were my inspirations. The publisher, Ernest Booth, published my first article with its photospread in 1965 called “Viewpoints on Nature.” I switched to live insect collecting by way of photographs in 1960 after getting really bored of just catching, killing, and displaying dead insects. I lived just across the street from a very prolific swampland in Southern California, so I became an expert on macrophotography of live dragon and damselflies in the field. You can call me a geek, for sure. I developed my own film and printed my own photographs in my own darkroom built inside the garage. Finding out about the competition was purely accidental after bumping into notices about other photographic competitions at Wikipedia. I was happy to discover that not only was there a competition in the realm of science photography, but that Wikipedia would be a great place to donate many very informative and inspirational photographs that have been in storage for years but not popular subject matter for generating income. Almost all of my insect, bird, and small animals photographs were done long before digital arrived. It wasn’t until 2010 that high-end digital scanners became affordable and I started converting my film-based collection to digital images. The Galaxy Within.jpg, by Dustin Johnsen, CC BY 4.0, via Wikimedia Commons. Dustin Johnsen is honored for The Galaxy Within, a 10x image of cultured mouse cortical neurons and astrocytes in cell culture. 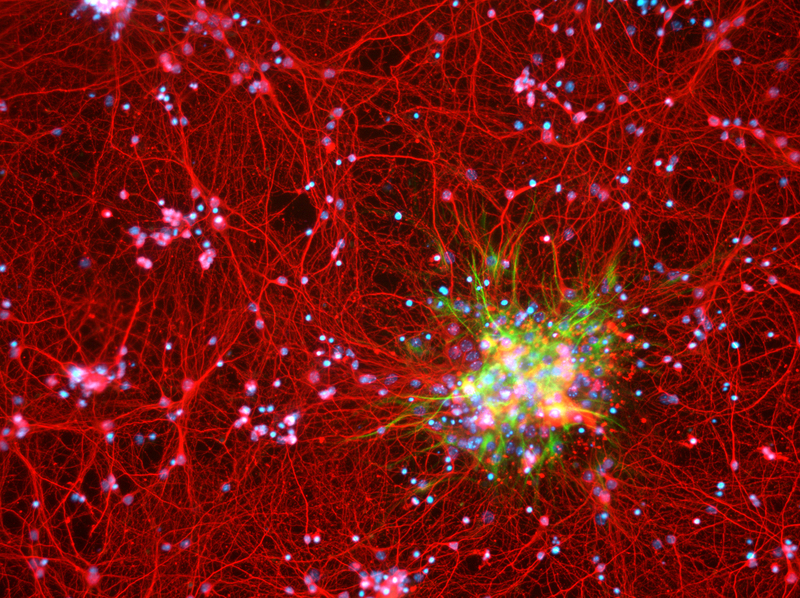 Neurons are stained red (MAP2 protein), while astrocytes are stained green (GFAP). Dchordpdx muses, “As the presumed seat of consciousness, the infinity of questions still surrounding the brain are as nebulous as those surrounding our infinite universe. We are but stars in the end; and in the beginning.” Dchordpdx also contributed a collection of images of neurons. I took the photo as a neuroscience graduate student at the Vollum Institute, Oregon Health & Science University (OHSU) in Portland, Oregon. The images were a part of a study investigating neuronal and astrocytic cell death in in vitro models of neurodegeneration. The brain is the most complicated piece of matter known to humankind, and due to significant advancements in technology, we’re just now beginning to learn how it works at the cellular and molecular level. The inordinate complexity and mystery of the brain rival that of what we see above us on a starry night. Nature often mirrors its designs across disparate disciplines, from mathematics to biology, and so images such as this one are a manifestation of nature’s self-symmetry between our Universe and our brain. I submitted the photo to this contest because I feel science is humanity’s most important language; it’s pushed us from our ancestral doldrums of simply interacting with nature to our modern vigor of manipulating nature — right down to the molecules of the mind. Science will continue to push us towards the stars, but only if we help translate it to the public to inform policy. Science is currently under attack politically and even culturally — the greatest such threat it’s experienced in my generation. And so inspiring awe and humility in the public through scientific images is one small way I can help advocate not just for science, but also for a peaceful and advanced future of the human race. Following my PhD dissertation and a postdoctoral fellowship (also at OHSU), I have started my own company brokering private philanthropic funds directly to high-risk, high-reward basic science research projects — the kind of ambitious projects science requires to make significant advancements, yet the type of projects that are largely being neglected by traditional government funding sources. Note: Image descriptions and quotes first published on Wikipedia at Wikipedia:Wiki Science Competition 2017 in the United States/Results, CC BY-SA 3.0. Parts of the descriptions are taken from the file pages on Wikimedia Commons.